Background: Irish, Italian, German and Cherokee Indian. The Band might have been called..
"The Jonas Trio", "The Sons of Jonas", "Jonas Jonas Jonas" and "Run Jonas Run" these names were suggested by Columbia Records. The Jonas Brothers are a very famous band. Every time you mention the name "Jonas Brothers" girls will start to scream or people or there will be people who know exactly what your talking about. They Released their first album "It's about time" with Columbia Records on August 8th 2007. They now record with Hollywood Record and Disney. The JoBros also recorded a single for the Disney movie "Meet The Robinsons" on March 30th 2007. On August 7th 2007 they released their second album "Jonas Brothers" Including the hit singles, S.O.S and Hold On. Joe Jonas is a 19-year-old successful lead singer in the Jonas Brothers Band. Before Joe became a musician he actually wanted to become a comedian. He enjoys running,playing wiffel ball and soccer while sipping his fav drink,orange Gatorade. He was born in Casa Grande, Arizona and grew up in Wyckoff, New Jersey and now lives in Los Angeles continuing his career. Wearing his purity ring, stating hes christian he preformed at his church in the choir. Favorite Actresses are Natalie Portman and Aishwarya Rai. He also likes Jim Carey. His fav bands are Copeland and Switchfoot and a singer he likes is Johny Lang. Joe's favourite flick is school for Scoundrels and is a big fan of the highschool musical movies and also starred in the Disney hit movie Camp Rock as Shane Grey. Owning 5 guitars, before the JoBros he and his brother Kevin were back up vocalists. Joe's favorite foods are chicken cutlet sandwich with mayonnaise, snow cones and his grandma's homemade pizza. 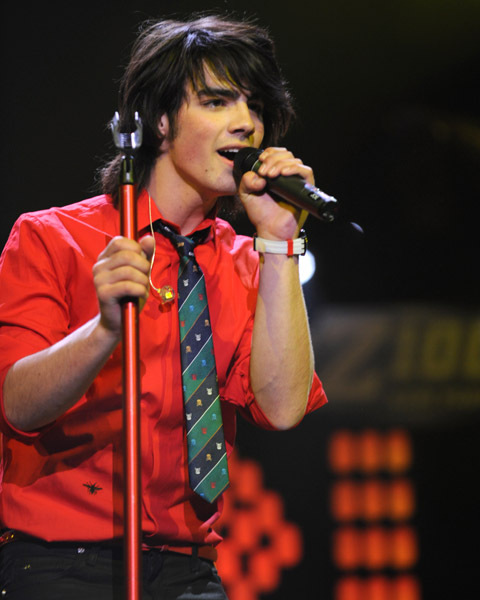 Joe Jonas was home-schooled in grade 7 and his favourite subject is math, he graduated from High school July 2008. He Enjoys watching Boy Meets World, Heroes, Lost, Friends and Most Extreme Challenge and his most favourite Holiday is Valentines day. Nick Jonas is the youngest member of The Jonas Brothers. He started his career on Broadway but was also discovered singing while he was getting his cut at age 6. He was doing a solo project until his agent found that his brother Joe and Kevin were also very talented. 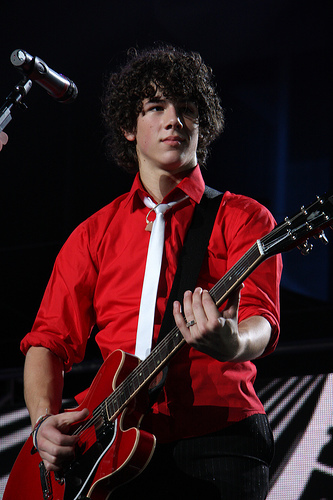 Nick was diagnosed with type 1 diabetes in 2005 while he was on tour. His favourite school subjects are spelling and geology. He likes playing baseball, golf, tennis, songwriting and collecting baseball cards. One of his fav movies are Juno and a song he likes his "Superstition." Nick J's most inspired by artists are Stevie Wonder, Fall Out Boy, Johny Cash, Elvis and Switchfoot. A song that Nick loves to sing live to his fans is "A Little Bit Longer." He owns 12 guitars! more then Joe and also starred in the hit Disney movie Camp rock, as Nate. Another interesting fact about Nick is that his favourite Holiday is Thanksgiving. 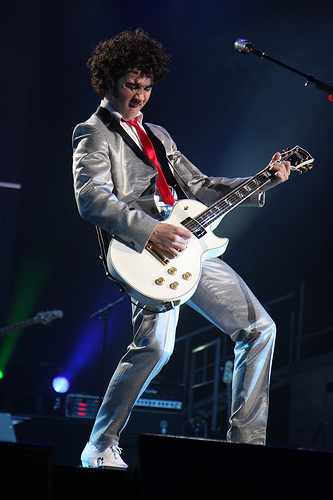 21-year-old Kevin Jonas is the oldest member of the Jonas Brothers. His Favourite sports are pole vaulting, bowling and he likes the board game Monopoly. During school Kev liked subjects, Latin and History. His fav stars are James Dean, Rachel, Mcadams, Hayden Panettiere and singer John Mayer. Kevin's most Favourite Holiday he likes to celebrate is Christmas. You should create your own MySpace Layouts like me by using nUCLEArcENTURy.COM's MySpace Profile Editor!